How Can You Help Someone Who Is Sick? Number #1: Don’t Make It About You. 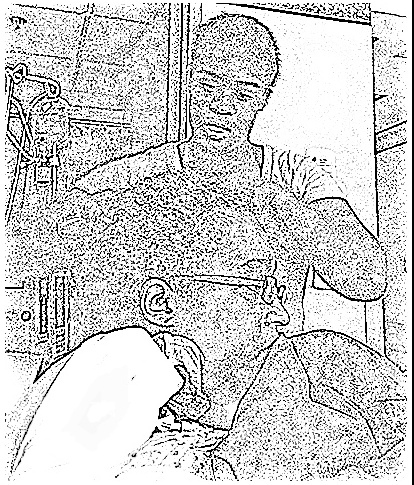 Barbara’s daughter caring for Barbara’s hair in the hospital. A couple of months ago, I was gravely ill in the hospital. I was so sick, said the Doctor as she was discharging me, that when I arrived in the Intensive Care Unit, I had an 80% chance of MORTALITY. My immediate family (husband, children) were wonderful to me. What caused me much distress was the calls from my sister and brother. My siblings and I are not a close bunch; the sister has been on and off drugs for over 30 years and my brother has had some challenges of his own. While I don’t (well, not anymore at least) argue with them about their life choices, I keep “arm’s distance” from them to keep the peace. Anyhow, in one conversation with my brother, he informs me that I should expect to hear him our sister. I replied “I can’t handle that”. You see, when my sister is “clean” talking to her is like trying to get a sip of water out of a fire house – just TOO DAMN MUCH. Brother takes offense to my response. He then proceeds with his monologue to explain his philosophy on life on “letting bygones by bygones”: giving an example of how it should be done, providing a personal example of how he has done it, etc…..Did I mention I was deathly ill? The sister calls. After speaking to our brother, I really need to take a breather from talking and I let the call go to voicemail. Sister calls again. Sister texts me “Hey this is “sister’s name”. I call her back. She is irritated that I did not pick up on the 1st call. Once we got past that, she goes into this – “What is happening to my sister? My perfect sister! Oh yeah, I heard you had some problems with the nurse – don’t let this ignorant and uncouth sister have to come down there”. When I replied that she should not consider herself “ignorant and uncouth” she reminded me that one time I called her that….see where I am going with this. Sister proceeds to tell me how well she is doing in life, work, love, etc. As the oldest of the siblings and with our parents deceased, it is my responsibility to say “Hooray”, “Good for you” – never mind I am only 4 days in a 14 day hospital stay; I was still really weak. Mentally, I was so wore out from those two discussions that I was depressed for the rest of the day, and it was only around 12:30pm. The fact that for once in my life I need my siblings to care for me, all I could get out of them are their feelings and concerns. So Sad.